Here it is with the Flat Box artwork that inspired it. The decals are reproductions of the original Flat Box kit decals by Greg's Kustom Graphics, except the Devil's Head and pinstripes on the rear which are from the new Revell 1932 Ford Five-Window Coupe kit. 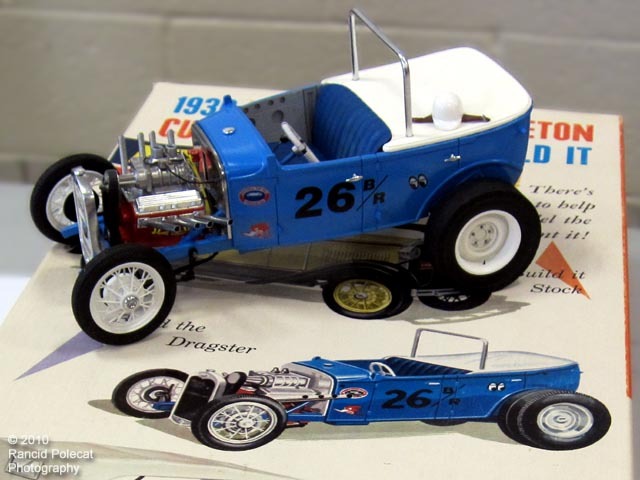 Norman painted the body and frame in Tamiya French Blue to match the illustration. The grille shell, roll bar, headers, firewall, and hubcaps are all coated in Alclad II Chrome paint.